Orca from Novomatic offers a splashing good time. This beautifully designed video slots furnishes five reels and an astonishing 50 paylines. The screen presents four rows of icons. Players spin the reels hoping that three or more will line up consecutively to furnish a jackpot. Due to the large number of potential paylines, players have the opportunity to spend a lot of money playing this game, and they also potentially win significant jackpots. The more paylines a player activates, the greater the number of possible wins. Three orca whales landing across an activated payline produce the most massive reward in the online slot game. Additional smaller jackpots occur with three or more penguins, sea lions, or varieties of deep sea fish. 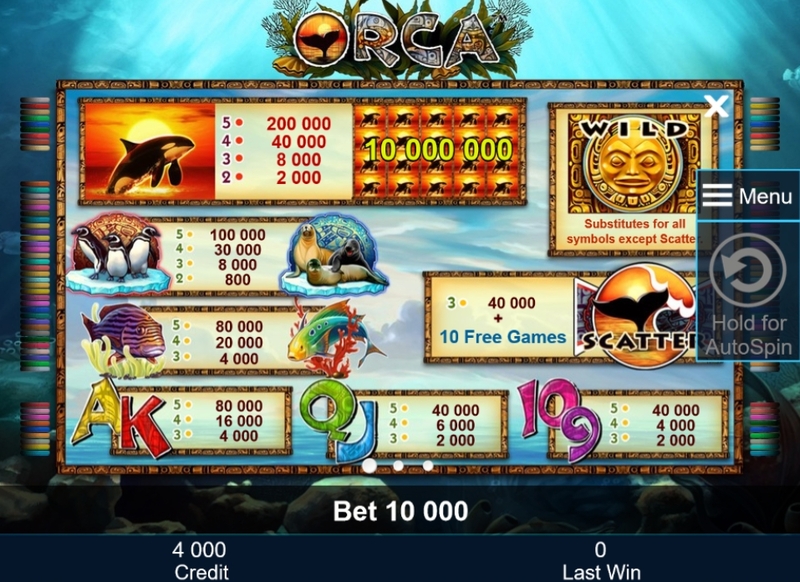 Three or more scatter symbols appearing on the screen launch a series of ten free spins. Additionally, a gamble features offers players the option of betting red or black cards to increase winnings from some spins. 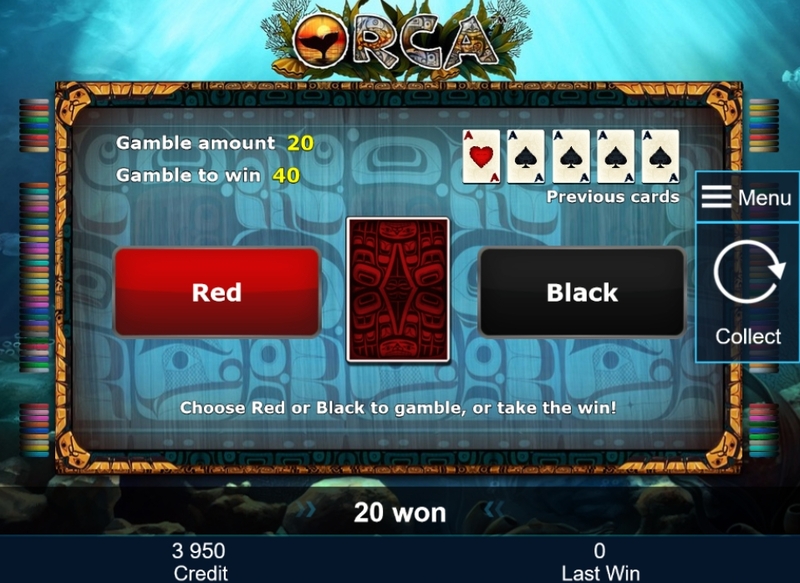 Orca also furnishes a wild card symbol, a sun mask, which will substitute for any other icons in the game to complete a win except scatter. The theme of Orca centers on deep sea life. Whales, marine mammals and many varieties of fish populate the screen. Additional icons include conventional playing card symbols: 9, 10, J, Q, K and A. Novomatic’s skillful design team developed an attractive, easily navigated game screen, using a watery blue background to invoke the imagery of the ocean depths. The very well drawn icons spring briefly into life whenever a win occurs. Penguins hop, orcas splash and card symbols briefly expand and contract in size. The excellent graphics lends interest to this colorful slots. Additionally, the background sounds of the game provide a pleasant, relaxing environment. Light tones accompany the spinning of the reels, interspersed by occasional penguin calls and waves sounds. These audible effects contribute to the game’s allure. 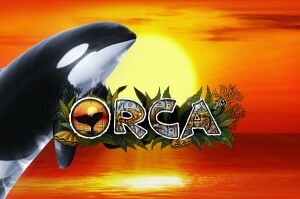 Orca offers a special “stacking” feature that enables players to keep collecting the killer whale scatter symbols in the game. Reportedly, some version of the game add an extra scatter symbol to reels two through five during every free spin game. 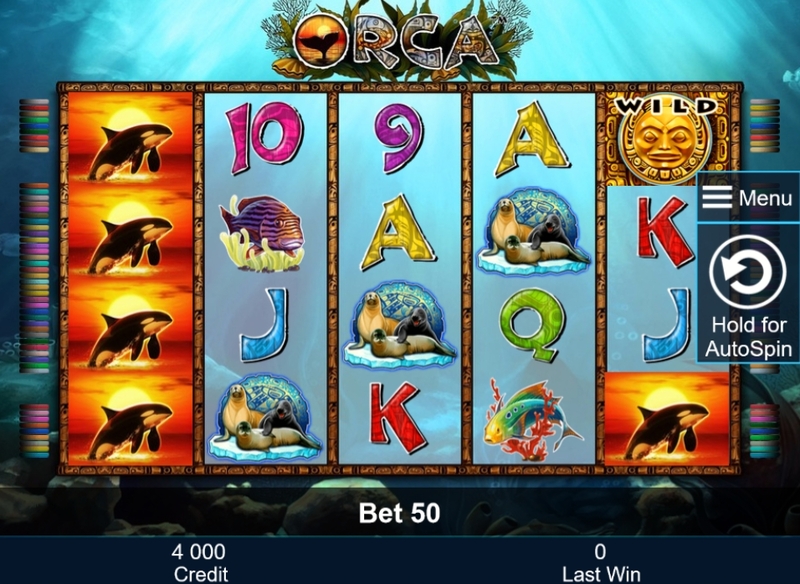 This potentially enables players to gain more orca symbols with longer playing sessions, although the extra orcas apparently occur only during free spins and not regular play. This game also loads well in mobile devices across a variety of platforms. 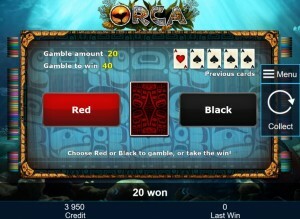 Orca offers players a consistent deep ocean theme, a pleasant game environment and some lovely visual imagery. It represents an exciting addition to Novomatic’s games. Most players will enjoy playing this dynamic non-progressive standalone online slots. Although activating every pay line may exhaust some player bankrolls, the availability of free bonus rounds will likely inspire many people to keep spinning the reels. During bonus play spins, the appearance of three scatters lining up in the reels triggers a smaller bonus round of five additional free spins in some versions of the game. The scatter symbol appears frequently. When players activate every payline, a whale of a payout ensues. 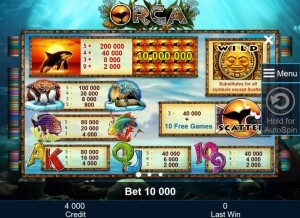 Collecting the killer whale icons on every row of the screen yields 500 times the bet (or more in some casinos). Even covering a single payline with orcas would involve obtaining ten times the original bet. Orca catches player interest.